A WARNING HAS been issued for widespread thunderstorm activity across the country today. 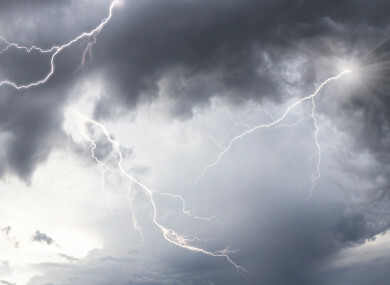 Met Éireann issued a status orange weather alert for widespread thundery activity this afternoon and night. The alert was issued at 9am this morning. It is valid from noon today until midnight. Earlier, the weather service issued a status yellow rainfall warning for Connacht, Cavan, Monaghan and Donegal. Some very heavy or thundery downpours are likely at times today – mainly in parts of Connacht and Ulster, with local spot flooding. The warning will be in place from 11am to 9pm. Nationally, it will be another humid day with mist and fog in some places this morning. Met Éireann says there will be some sunshine breaking through this morning but in general it will be cloudy with a few patches of rain or drizzle. The heavy downpours will develop in places by late morning with a high risk of thunder and localised spot flooding this afternoon. AA Roadwatch warned motorists of the incoming weather, advising people to take care on the roads. “Remember to reduce your speed when driving on wet roads and keep a safe distance from the vehicle in front,” the traffic service said in a statement. The rain will be heaviest and most persistent across the northern half of the country. Top temperatures will range from 18 to 22 degrees. Heavy rain with thundery bursts will continue for a time across Ulster and north Leinster early tonight, but will clear away to the northeast soon after midnight. Cooler, clearer weather with isolated showers will then extend to all regions. Minimum temperatures will dip to 10 to 13 degrees in moderate southwesterly winds. Tomorrow looks set to be a bright, breezy day with sunny spells and scattered showers. The showers will be largely confined to Atlantic coastal counties but a few will drift further inland. Top temperatures will range from 16 to 19 degrees in moderate to fresh southwest winds. Email “Motorists warned to take care as widespread thunderstorm warning issued”. Feedback on “Motorists warned to take care as widespread thunderstorm warning issued”.